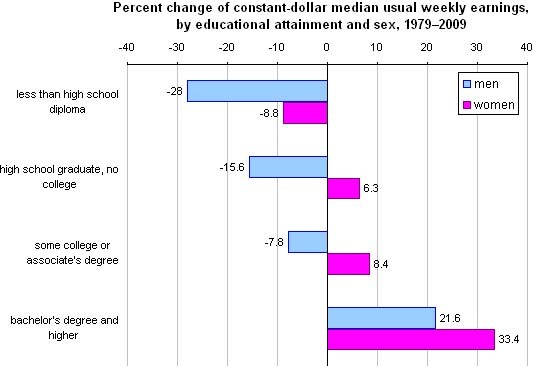 As you can see, most men today earn less than equally educated men in 1979, with the exception of the most highly educated. The opposite is true for women: Most women today earn more than their equally educated counterparts from 1979, with the exception of the least educated. The upshot is that even as the cost of college comes under scrutiny, the evidence continues to suggests that four expensive years is the price our generation has to pay if we expect to earn more than our parents. Read the whole thing at Economix.